The Los Angeles Chargers defeated the Oakland Raiders, 20-6, in Week 10 of the 2018 NFL season. Melvin Gordon did it all for the Chargers in this one. He forced multiple missed tackles both as a runner and receiver, lifting him to a near-perfect performance. Philip Rivers‘ impeccable performance under pressure so far this season came crashing down in this one. His desperation heave that got picked off was uncharacteristic of him this year. Uchenna Nwosu was a problem for fellow rookie Kolton Miller. He had a sack and multiple pressures on the day. Derwin James was once again always around the football. He had made plays as a pass-rusher and helped solidify the Bolts’ run defense on the back end. Derek Carr was unwilling to take the chances necessary down the field to win this one. He rarely pushed the ball 10-plus yards down the field. In what’s been a rough year for Miller, we may have seen his lowest point. He allowed multiple hurries on the day, highlighted by getting beaten one-on-one by James late in the game. Maurice Hurst was the lone bright spot for the Raiders’ defense up front. He registered a sack and multiple defensive stops against the run. Gareon Conley‘s sophomore struggles continued in this one. He allowed all of his targets to be caught, with the most noticeable one being the Gordon 66-yard touchdown that Conley whiffed on. 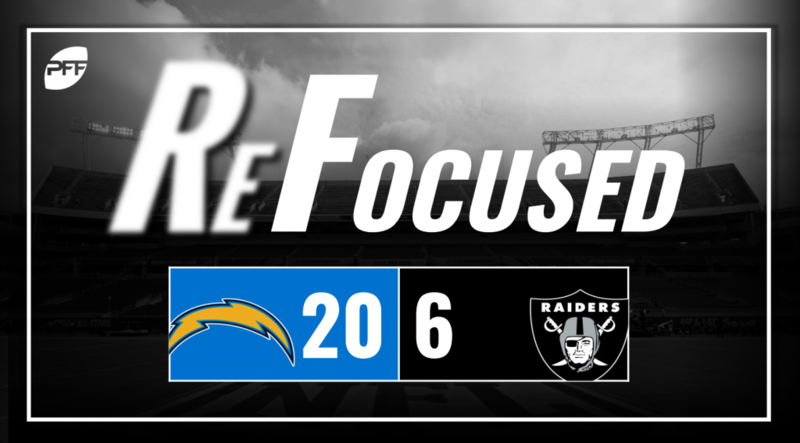 The young playmakers for the Chargers on defense were the story in this one. James and Nwosu look like difference-makers already. Carr wasn’t under pressure very often, but when he was, it was almost immediate and gave the offense no chance in this one.